Clematis 'General Sikorski' is an outstanding variety which freely produces charming, mid blue flowers from July through to September. This non-evergreen climber can be grown against a trellis, garden fence, wall, arches, pillars, pergolas, clambering over tree stumps and through large shrubs or planted in a container trained up bamboo canes or an obelisk. 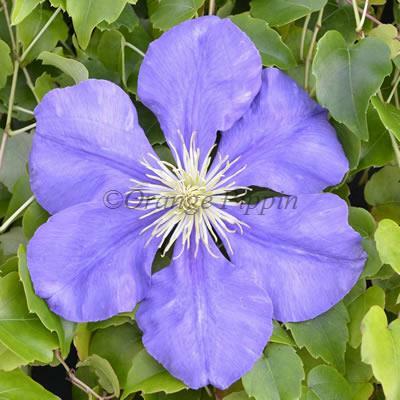 Clematis ‘General Sikorski’ is believed to have been raised by Brother Stefan Franczak of Poland in 1965. There is a great deal of confusion as to whether ‘General Sikorski’ is the same cultivar as ‘Jadwiga Teresa’, but it seems very possible. Story has it that in 1969, Franczak sent a specimen of ‘Jadwiga Teresa’ to Wladislaw Noll in Poland, who renamed it ‘General Sikorski’ (there is some doubt about this). It was then introduced into the UK by Jim Fisk in the early 1980’s as ‘General Sikorski’. Franczak has now grown ‘both’ cultivars side by side and can identify no difference. Although there is doubt, it was decided to list them separately. Clematis ‘General Sikorski’ was named in honour of Wladyslaw Eugeniusz Sikorski (1881-1943), a Polish general and politician who gave great service to his country. After the conquest of Poland by Germany in 1939, he became Prime Minister of the Polish government in exile that was based first in France, then in England. He was also the commander-in-chief of the Polish air forces that fought alongside the Allies, and of the underground Home Army in occupied Poland. He died on 4th July 1943, in an airplane crash near Gibraltar; the exact circumstances have never been established.